A cowboy drives a herd of cattle to a winter range in Oregon. Photo Courtesy of the United States Department of Agriculture. Photo by Doug Wilson. 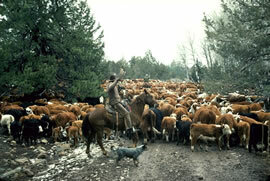 Beef cattle are raised primarily on huge ranches in the western and southwestern parts of the United States. Cowboys still work large cattle ranches rounding up cattle for branding and checking on cattle herds that graze over areas spanning thousand of acres. However, mechanization and improvements in transportation have eliminated much of the need for cowboys. Today it is easiest to find cowboys at rodeos where they test their horse riding and calf roping skills. Click on PICTURES below to see a photo of beef cattle at a huge feed lot. Click on CHARTS and MAPS below for additional information about beef.